Want to save money and energy with your ceiling fan all year long? Give this advice a spin! Since its invention in the late 19th century, its introduction to American homes in the 1920s, and its resurgence in popularity in the 1970s, the ceiling fan has been a saving grace during the dog days of summer. 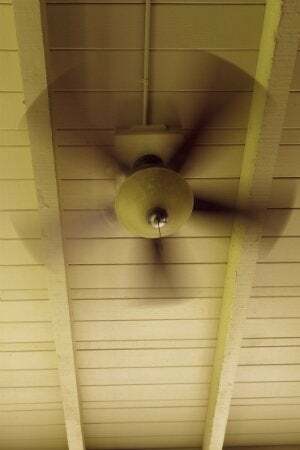 Even with the proliferation of air conditioning, a simple overhead fan still offers the instant satisfaction of a breeze in a stale room, making it feel cooler even though the temperature hasn’t really changed. Yet not everyone realizes that a ceiling fan can make a cold space feel warmer in the winter. All it takes is a change in ceiling fan direction, reversing the air flow to suit your needs according to the season. Popular for their ability to redistribute cool air throughout a room, ceiling fans turn counterclockwise and create a current that moves down and out, which then sends air back up along the walls. This creates a sense of coolness because cool air naturally pools near the floor while hot air rises—the blades redistribute the already-cool air near the floor up to a level where you can actually feel it against your skin. That’s a boon to your pocket as well as your body, by lowering your utility bill. According to the U.S. Department of Energy (DOE), if you use air conditioning, a ceiling fan will allow you to raise the thermostat setting about 4°F with no reduction in comfort. In temperate climates, or during moderately hot weather, ceiling fans may allow you to avoid air conditioner use altogether. For extra savings, the DOE also encourages turning fans off when you leave the room, because the devices cool people, not the air itself. Pro tip: Ceiling fans are only considered safe in rooms with eight-foot ceilings or higher, but to maximize their efficiency, make sure your blades hang 10 to 12 inches below the ceiling and somewhere between seven and nine feet from the floor. It might seem counterproductive to turn on a fan when what you want is to get warm, but in fact, a ceiling fan can help to maintain a comfortable temperature during the winter. A fan set to move clockwise (opposite the ceiling fan direction in summer) and run on low speed creates an updraft. That pulls cold air up to the ceiling and more evenly distributes the warmth the room receives from your central heat, space heater, or fireplace. The fan keeps things cozy throughout your living space instead of letting cold pockets settle anywhere. Again, the temperature isn’t actually changing; it just feels that way—so, as in the summer, turn fans off when exiting a room. Ceiling fan manufacturers claim that if you do this consistently and correctly, you can reduce heating bills by up to 15 percent. Pro tip: There are ceiling fans with built-in space heaters on the market, and while they may not save you energy or money, they can solve the problem of a perennially cold room when central heat just won’t cut it on its own. These units are pricey, however, about $250 on the low end. Nearly every ceiling fan has a switch on the motor housing that changes the blades’ movement from counterclockwise (the standard setting) to clockwise, and vice versa. When winter’s chill hits your home, first check your wall panel (if you have one) for a reverse-direction setting, which is the easiest way to flip from summer mode to winter mode. Press it once and look up to make sure the blades are moving the way you want them to. If there’s no wall panel option, turn the fan off and climb a sturdy ladder to reach the switch on the motor housing. If the switch isn’t immediately visible, check the top of the motor housing, above the blades; remember, it’s critical that the fan not be moving at all, lest you risk injury. Once you’ve flipped the switch, climb down and turn the fan on low, then give it a glance to ensure it’s running in the right direction. Pro tip: Very few, if any, ceiling fans are made without a direction switch on the motor housing, so if you’re stymied, consult the manufacturer. And if you’re in the market for a new ceiling fan, make sure it has a direction switch and learn its location.